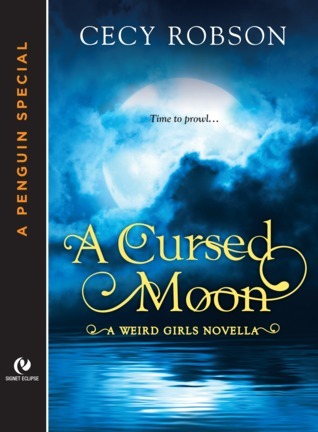 A Cursed Moon is a novella told from the perspective of Bren, Celia’s were friend. Novellas are always hit or miss for me, rarely do they fall in the middle, and luckily, A Cursed Moon is a huge success. I adore Cecy Robson for being able to build such a fabulously complex character in a single novella. I feel like I know Bren well now, and I certainly understand what makes him behave the way he does. I have to admit I was a bit worried at first – Bren’s devil may care attitude grated on me and made me severely uncomfortable, but Robson did a fabulous job of explaining his character in a way that made sense and that succeeded in endearing him to me in a matter of minutes. The loyalty and love he shows his friends on a daily basis more than make up for his sometimes obnoxious behavior. It was also nice to see Celia through someone else’s eyes. Due to her confidence issues, we never really got the sense of how other people might see her, so being privy to Bren’s thoughts was truly eye-opening. It is now even more clear that Celia has a somewhat distorted self-image and that she is, in fact, both fierce and stunningly gorgeous. Even though this novella focuses on Bren and his new position in Aric’s pack, a big part of it continues to explore Celia and Aric’s situation. These two break my heart to teeny tiny bits. Their love for each other is so strong, but Aric is not selfish enough to put his own desires and happiness above that of his pack. They are the very definition of star-crossed lovers, and Robson writes these emotional moments extremely well. For a novella, A Cursed Moon is pretty eventful and it brings some permanent changes, which is rather unusual. I can’t wait to see how they will reflect on the series as a whole in Cursed by Destiny, the next novel in this wonderful series. Ooh, permanent changes? I'll have to check this out ASAP then. I skipped the prequel novella since I wasn't too interested, but I definitely want to read this one. Fantastic review, Maja! I LOVED this! But I already liked Bren and his devil may care attitude so I was excited to get a better insight into his personality and life before meeting Celia. Squee..I have this ordered and cannot wait to read it tomorrow! So glad you enjoyed Bren's perspective. I love when a novella makes actual changes to the overall series plot or dynamic, rather than just being a filler throwaway story. It's always lovely to get a new perspective on beloved characters as well. I can't wait to catch up and get to this so I can read more about Aric's pack and Celia and Aric's starcrossed romance. Wonderful review! Oh I loved loved this novella as well! The same for book 3 and I can't wait for more! Wow. I'm so glad you enjoyed A Cursed Moon, Maja. Many thanks for everyone who stopped by. Ooh nice review! Cannot wait to read this one myself! It's awesome that the author was able to create such a nice novella. I always feel like I'm being rushed when I'm reading one. Great review! I have the first 3 books on my tbr ready to go and I need to get to them. So glad to know that the novellas also rock. They can be so hit or miss with me. This one looks like one I do want when I read the series. I am an idiot and II read the third book before the novella. I am tackling the novella tonight. It will fill in missing pieces for me. I know what you mean about Celia and Aric. I want to bang my head into the wall. Ooooh, I so love it when novellas manage to show us something different and enrich the world of the series they're part of. Oh yes. Bren really shined in this story. It was great to see someone so...bold. ;D LOL! That's great that this novella brought so much to the table! This is a series I've been wanting to read.